I remember my first sermon very well. Not because it was a fantastic exposition of Gods Word….actually, it was quite the opposite (although those in attendance that day were very kind and encouraging with their words concerning the message…it was bad. Really, really bad). I remember saying a whole lot without ever really saying anything. I remember sweating bullets before, during and after the sermon. I remember bowing just before my Pastor called me up to the pulpit and asking God not to simply help me, but keep me alive as my nerves were shot and for some odd reason, I thought, I mean REALLY thought, that my heart would soon cease to beat. What I remember most about that first sermon though, was the endless ritual of rehearsal I went through in the week leading up to the big day. At the time I was working in public recreation and as I would mow ballfields, I preached my sermon. I did the same when picking up supplies, lining baseball fields, etc. I must have preached that sermon a hundred times before, you know, actually preaching the sermon. I distinctly recall being unusually frustrated with how I sounded one day as I was “rehearsing”. I thought that I sounded like a naïve, inexperienced, backwoods 20 year old (which I was, by the way). I decided that it’d be wise to listen to some preachers who weren’t naïve, inexperienced 20 year olds and kind of adopt their style, mannerisms and even tone so that I would be heard and taken seriously. One of my favorite stations to listen to was Toccoa Falls Radio (90.9, I think) and they broadcast the sermons of two of my favorite preachers (still are to this day), the late Dr. Adrian Rogers of the Bellevue Baptist Church and Dr. Tony Evans of Oak Cliff Bible Fellowship. I listened intently to their messages that day and even jotted down a couple of things that I liked about their style. Dr. Rogers impressed me with his tone, voice inflection and as silly as it sounds the way he pronounced certain words. Dr. Evans consistently blew me away with how seamlessly he could move into a illustration that just pulled everything together. After multiple sermon rehearsals, the big day finally arrived and unfortunately a very poor version of Adrian Rogers and Tony Evans stood nervously behind the pulpit and preached an even poorer sermon. It wasn’t me. At All. Sadly, this routine became the rule for me and not the exception as old habits die hard. I found myself mimicking preachers that I loved and respected for the next few years. If I’m not EXTREMELY careful, to this day I’ll STILL do it. I know better now. I didn’t then, though. All that I knew as that they were great preachers and I wasn’t. They had years of experience and I didn’t. They had pulpits in prominent, fruitful churches and I was begging for opportunities to preach anywhere. So my best option, at least in my opinion back then, was to just be them. That was a poor, poor decision. A few years later a mentor of mine noticed the strange tendency I had to go into “preacher mode” when I stood behind the pulpit and was loving enough to “jerk a knot in my tail” (his exact words). He explained to me that if God had wanted another Tony Evans or Adrian Rogers, He’d have made them. He explained to me that my tendency to step outside of who I am was really a slap in the face of the God who had uniquely created me (fearfully and wonderfully, I might add). He was painfully right and I knew it. You see, I don’t think that I meant to act in a way that was an affront to God. I really don’t. I actually thought that what I was doing was good and had a great purpose. The end justifies the mean was my personal justification. I mean, people liked Adrian Rogers and Tony Evans and if I preached like Adrian Rogers and Tony Evans they’d like me. If they liked me, they’d respect me. If they respected me, they’d listen to me. If they listened to me, they’d hear the Word and if they heard the Word….you see where I’m going with this, right? Even to this day with hindsight being 20/20, as wrong as I was, I really think I meant well. You see, the content of the sermons I delivered eventually got better. By Gods grace, a few were pretty good, actually. People listened, had wonderfully encouraging words to say and in spite of my little act, God even saved people through my preaching (you have no idea how humbled and grateful I am by that). Yet, I knew in my gut that what I was doing, though it seemed to be working, was just not right. I knew it because I had to live with myself. I knew it because of the way people who knew me best would look at me. I knew it because the relationships that I had with those I was preaching to were largely built on, well, a lie. I knew it because Gods Spirit within me was grieved. Fact is, I wasn’t comfortable in my own skin and I knew the charade just couldn’t last. I wanted to change but I just needed someone to exhort change in me. My mentor friend, and his tough love, was just what the doctor ordered. Today, I am me. It’s hard to describe the freedom and liberty that came just by typing those words. I am me. I’m an open book. I’m the same dude in the pulpit as I am in the deer woods, on the bass boat, at the ballfield or at the house. I’m open with my flaws and failures, I’m tattooed and scarred (both figuratively AND literally), I’m imperfect and I totally own that fact. I’m me….and I’ve never been more content. I’ve found that authenticity (which has become a hallmark of my own ministry) is fruitful. I mean real fruit, the kind of fruit that comes when someone is willing to come by and have a chat because “I felt comfortable talking about this with you because you’re real”. That blesses me. Now, full disclosure: the transition to “keeping it real” isn’t appreciated by everyone. There will always be those who would rather the Pastor be as fake as a televangelist hair. You know, use the “Preacher Tone”, never have problems, be iron starched and have a perfect family. “Real” from the preacher appalls them. I’ve dealt with that and though it’s a tough pill to swallow when someone just flat out doesn’t like you, I’m willing to take the risk because for every one that doesn’t like true authenticity, there are ten who realize they need it from their Pastor. I say all of that to say this: Be real. Be authentic. 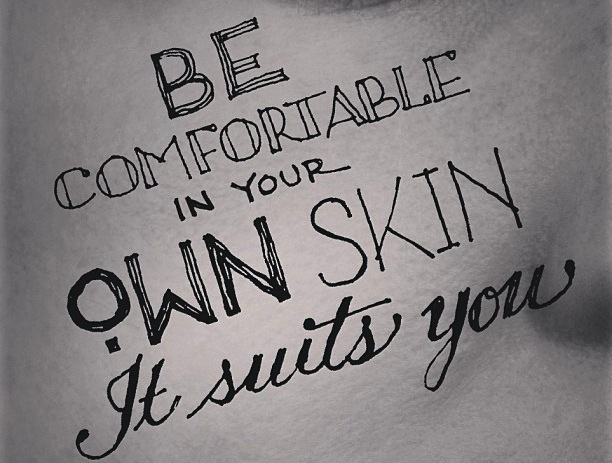 Flaws and all, learn to be comfortable in your skin. God made you and He don’t make junk. Let Him use the REAL you for the good of His church and for His own His glory and you’ll be amazed. Previous Previous post: Because We Follow Christ, That’s Why.